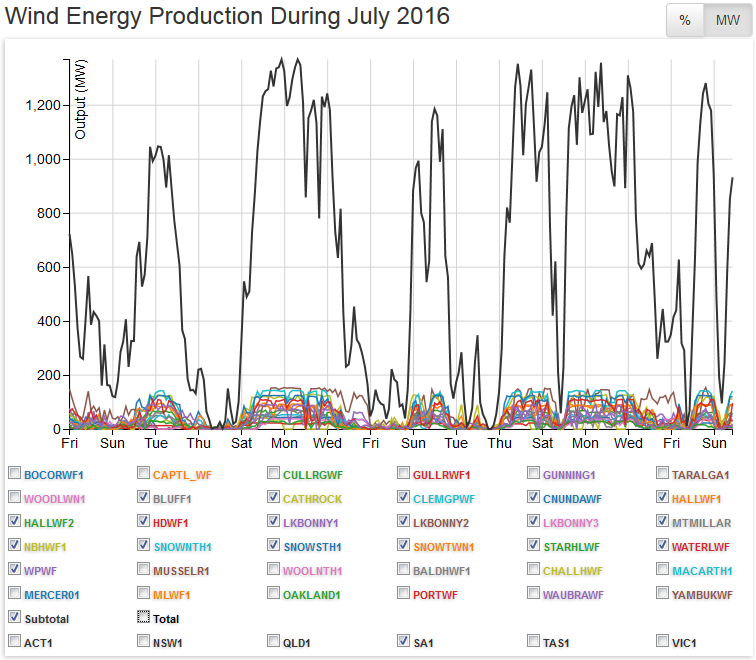 In the fall-out over South Australia’s wind powered economic and social calamity, the line has been repeatedly spun about fixing the mess with ‘rapidly improving battery storage technology’. 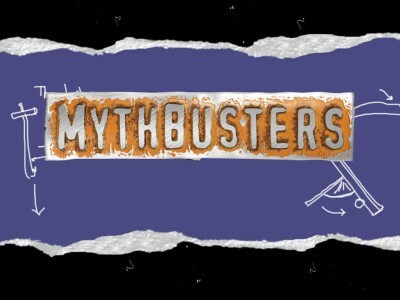 Even if storing Terawatt/hours of electricity produced by these things – when it wasn’t needed, in order to deliver it when it might be – was technically possible the cost of the power delivered would be astronomical, as this little Mythbusting analysis makes plain. A recent Telegraph article claims that storage battery technology is now advancing so fast that “we may never again need to build 20th Century power plants in this country, let alone a nuclear white elephant such as Hinkley Point” and that the “Holy Grail of energy policy” that will make this solution economically feasible – a storage battery cost of $100/kWh – will be reached in “relatively short order”. This brief post shines the cold light of reality on these claims by calculating battery storage costs based on the storage requirements for specific cases estimated in previous Energy Matters posts. It is found that installing enough battery storage to convert intermittent wind/solar generation into long-term baseload generation increases total capital costs generally by factors of three or more for wind and by factors of ten or more for solar, even at $100/kWh. Clearly the Holy Grail of energy policy is still a long way off. First a simple calculation. $100/kWh = $100,000/MWh = $100 million/GWh = $100 billion/TWh. If everyone is happy with this we can proceed. (Note that all the costs listed in this post are in US dollars unless otherwise specified). Hinkley Point C or solar, which is cheaper? Battery storage needed to convert Germany’s 2013 solar generation to baseload: $800 billion, about 13 times the $66 billion cost of installing the ~33GW of solar capacity involved. Battery storage needed to convert solar generation equal to a year of Hinkley nuclear generation to baseload: $700 billion, about 28 times the ~$25 billion cost of the Hinkley plant. Battery storage needed to convert solar + wind generation equal to a year of Hinkley nuclear generation to baseload: $350 billion, about 14 times the cost of the Hinkley nuclear plant. I added a small project– Gorona Del Viento – to round the estimates off. During its first year of operation GdV generated only about half the wind energy needed to fill El Hierro annual demand, but had it generated 100% of it then 10GWh of storage would have been required to store the wind surpluses for re-use in windless periods. The cost of installing this much battery storage is $1 billion, approximately ten times the €82 million euro project capital cost. Your calculations agree with my back-of-envelope estimates. In SEWTHA Ch 26 I said “imagine we had 33 GW of wind capacity, delivering on average 10 GW”; I reckoned that ballpark of 1000 GWh of storage would be needed …. Mackay’s estimate gives a ballpark battery cost of $100 billion, not quite twice the $66 billion cost of installing his 33GW of wind power but again well in excess of it. Clearly large-scale battery storage will remain uneconomic even at the Holy Grail price of $100/kWh. So why do battery companies, research institutes and greens claim the opposite? Because they assume that the intermittency problem can be solved simply by installing enough storage to balance daily load fluctuations. A large amount of storage isn’t necessary to do this, and $100/kWh batteries might indeed be able to supply it without breaking the bank. But they ignore the much larger amounts of storage that are needed to keep the electricity coming during extended windless periods and/or to flatten out seasonal variations in solar output. Why? I see two possible explanations. First, they are being carried along in a wave of visionary enthusiasm and haven’t recognized it as a problem; second, they know about it but don’t want to tell anyone because it might spell the death of large-scale storage battery research, and ultimately maybe the death of intermittent renewables too. I’ll let the readership make up their minds as to which it is. Ok, it’s big, but what’s it cost? I also looked into this and found bulk storage of even pumped hydro to be an economic no go. Batteries will be far more expensive than pumped hydro. I calculated a wind only electricity system for UK to meet current demand would need at least 17.5 TWh of storage. 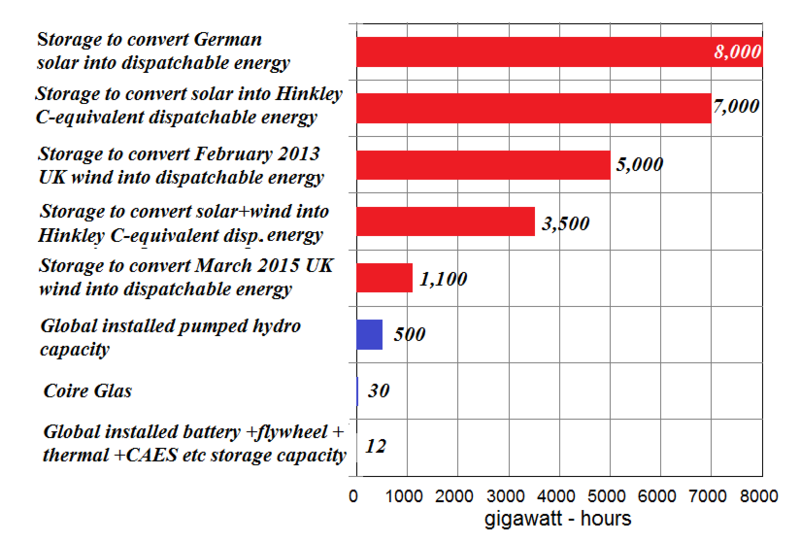 https://greenfallacies.blogspot.co.uk/2016/02/how-much-electricity-storage-would-wind.html The main problem with storage is that it must be used on a very regular basis to be profitable. Current UK energy storage is used every day to quickly meet peak evening demand; so gets daily revenue. Over time regular revenue pays back the huge capital costs of installation, as well as running costs. Much wind storage, in contrast, can only ever be used intermittently. Because very low wind periods can be reasonably scarce but may last a long time (easily up to 3 weeks, as in September 2014). So most of the storage required to prevent blackouts and brownouts would be used too infrequently to ever pay back the cost of its installation. I spent about USD$2400 on reconditioned lead acid forklift batteries for a 300W solar array. None of the solar controllers and battery chargers commonly available through the renewable energy industry adequately recharge the batteries. They restrict the output charging voltage to about 14.6V (for a 12V battery bank). 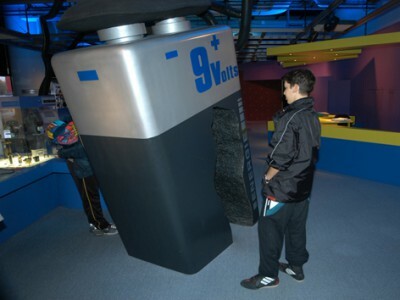 When a battery is fully recharged it reaches an open cell voltage of 15.1 volts. The lower charging voltage results in chronically undercharging the batteries to such an extent that the batteries lose a lot of their capacity within about 2 years. This results in running the generator a lot more frequently to top up the batteries. If you assume that huge bank of storage batteries for industrial wind farms and solar farms will suffer similar problems, then backup battery storage for the grid would be even more expensive that the cost estimates in this article suggest … and totally untenable. “Climatism” above has almost “got it” for the point I would like to add. The mining issue is not trivial. What needs to be added, I think, by the writers of the otherwise excellent articles quoted above is some feel for the numbers of batteries required, their physical size, and the many millions of tonnes of active material (whether it be Lead, Nickel, Cadmium, Lithium, etc. ), and how many billions of tonnes of waste rock generated in the mining required for those millions of tonnes of active materials required in all those batteries. Waste rock itself is highly toxic to the environment, whether or not it contains toxic, and possibly radioactive, heavy metals to add to the mix. Waste rock from mining contains sulphides and sulphates. Rainfall on what are the now-surface stored waste rock dumps resulting from all that mining results in enormous quantities of sulphurous and sulphuric acid runoff into creek and river and catchments. Not a trivial matter by any means. There is also the little matter seemingly not understood by the-fairies-at-the-bottom-of-my-garden green idealists that batteries do not come charged: they do not constitute some sort of energy supply until charged. Apart from costing a lot, as outlined above, they also constitute an enormous, and enormously expensive, ongoing maintenance problem. As you correctly say STT, here is another energy supply myth exploded. Very insightful. Thanks for your valuable comments, Paul. We just installed an 80kw solar system and when we asked the solar provider about future battery/storage opportunities, he simply laughed. $1 BILLION dollars and I bet the wind industry won’t foot this bill. Please when the batteries are full turn the blasted wind turbines off… the ‘quiet’ of no sound or vibration will be heavenly. How long does it take to fill a battery? Then empty it. Will the batteries be placed alongside turbines? Is it too hard to hear that wind energy is expensive and doesn’t work and reverse it? With added expense of interconnectors and don’t yet work batteries what a botch up of a system evidently based solely on greed and not care for the public. Some children walk before they crawl but the wind industry has done neither its just a headlong rush to disaster. Though even if it were possible, imagine how many new mines would be needed to be dug to extract the toxic components needed to make all them batteries.